How to Measure Shared Leadership? What motivated you to pursue this research? This research started its life as a second-year PhD student seminar paper, with a completely different research question and design. I was very interested in shared leadership and how different patterns of leadership within a team might affect its outcomes. Over several iterations of that paper, though, I became increasingly dissatisfied with the way shared leadership was measured in the literature. Specifically, I wasn’t convinced that the ways shared leadership had been measured – as an aggregation, or as network density or decentralization – could fully capture it in a way consistent with its conceptual meaning. I shared these concerns with a few co-authors who are far smarter than I am, and we agreed that tackling this measurement issue was potentially more important and interesting than my original research question. Further, over the course of the manuscript’s development and with the help of co-authors and reviewers, I soon realized that these measurement issues aren’t limited to the study of shared leadership. In fact, we feel they’re widespread throughout the organizational literature on team properties with particularistic qualities. There are many other team constructs, like shared mental models and advice networks, where a ‘tie’ from one member to another becomes more valuable when the sender is better connected. For instance, someone receiving lots of advice from others should in turn offer better advice, and if someone views you as a team leader, that’s a more powerful link if that person is him or herself seen as a leader by others (and it’s more consistent with the core idea of ‘sharing’ leadership). When we realized how many streams of research might benefit from a network statistic that specifically accounted for these types of team configurations, we hoped that we might make an impact on the field by proposing a potential solution. What has been the most challenging aspect of conducting your research? Were there any surprising findings? In order to build a formula for a network statistic that would solve the issues we encountered, it was necessary to do a ‘deep dive’ into the literature on network methodology: You can’t suggest an additional path forward if you don’t understand where the literature has been. This was at times a difficult challenge for us, as none of us are focused methodologists. Speaking only for myself, many older methods papers can be difficult to decipher for a relative layperson like me (one of the reasons I like ORM is that so many papers are written relatively simply). We tried to build on that research to generate a new measurement tool that would provide added value, and I can’t tell you how many weeks we spent going over and over our formulae to make sure they were accurate and appropriate. I have a stack of Pizza Hut napkins on my desk right now, covered with scribbled math and algebra (a habit which did not amuse my wife). And finally, after we were confident that we’d got it right, the next challenge was to distill it into a manuscript that everyone, not just network statisticians, could understand. Hopefully we did a good job of this. What advice would you give to new scholars and incoming researchers in this particular field of study? Don’t be satisfied with the way research is conducted, just because that’s the way research has always been conducted. Just because an assumption has never been seriously questioned does not mean it should not be questioned. Just because an idea or a theory or a method has been printed in an A-journal, doesn’t make it right. Always approach research from the perspective not of how it’s commonly done, but how it should best be done. Along those lines but more specific to our paper, this means carefully examining how a construct of interest is measured. We proposed the importance-weighted density (IWD) statistic for particularistic resource networks, but we acknowledge that what measure you use really depends on your research question. There are some hypotheses for which density or decentralization would be a better fit than our IWD. As always, conceptualization and theory should drive measurement. Stay up-to-date with the latest research and sign up for email alerts today through the homepage! In the Netherland organisations are ever more working with teams, because teams have the potential to outperform individuals. However, teams struggle to make that happen. 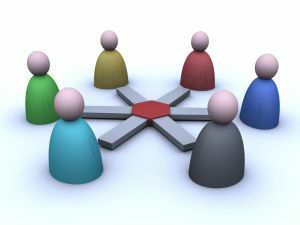 In previous research a model of developmental space for teams was developed to indeed outperform individuals as a team. Teams create developmental space in their interactions by undertaking four activities: creating future, reflecting, organizing and dialoguing. It appears that the more developmental space teams create the better their results. While creating developmental space, teams need to focus on the performance (creating future and organizing) and sensemaking (reflecting and dialoguing) orientations. These two orientations appear to be at odds with each other in other words, a paradox. How teams experience and handle this paradox and whether this is a critical success factor for them is not yet clear. Therefore, our research question is: How do teams experience and handle the developmental space paradox and what effect does that have? There is a rapid growth of research on paradoxes. However, the commonalities across studies remain unclear, with each study presenting its own solutions to handling paradoxes. We picked up the challenge to present an overview of the literature about handling paradoxes and empirically test the findings. Unraveling the process of handling paradoxes by studying the literature led us to the idea that handling paradoxes involves a process of making choices, consciously or unconsciously, in which each choice influences the next step taken. Bringing the outcomes of different studies together, we discern the three following steps in the process of handling paradoxes: 1) recognizing the paradox; 2) responding to the paradox; 3) deploying coping strategies. In our study we present these steps in an overview and tested this empirically. Recognizing the paradox and embracing the two sides of the paradox seem to fuel team success. Stay up-to-date with the latest research from the Journal of Management Inquiry and sign up for email alerts today through the homepage! What inspired you to be interested in this topic? Positivity has been studied extensively at the individual level, and studies have shown that having a positive, optimistic outlook has numerous benefits for the individual. However, when you consider the reality of the workplace, most of us work in some kind of team setting. So this was a research gap: How does positivity emerge in dynamic team interactions, rather than viewing it as an individual experience? Much of our attitudes and experiences at work are shaped by the social context, in terms of what our co-workers are doing, and in terms of timing. For example, whether or not a team member expresses positivity could depend on the momentary focus of a team conversation (e.g., focusing on problems versus on solutions) and also on the temporal context (e.g., positivity might be more likely later on in a team meeting, when lots of good ideas have been brought to the table). Moreover, I’m fascinated by the concept of conversation dynamics, or conversation flow: Consider a team meeting where one speaker dominates the discussion, versus a meeting that is truly dynamic. Positivity should be more likely when the team conversation is more dynamic, such that many team members are involved and invested. In addition to predicting when positivity would emerge within team conversation processes, we were also interested in performance linkages. Given the many individual benefits of being optimistic, we expected that team positivity would also aid team performance. Were there findings that were surprising to you? Speaker switches – i.e., how dynamic a team interaction was – played a major role. Speaker switches led to an immediate “boost” in positivity, and they also elevated the effects of other conversation characteristics on positivity (e.g., positivity was more likely after a solution statement particularly when there were lots of speakers involved). But what I found really astonishing was the fact that team and individual variables (e.g., how much an individual team member talked overall) explained only 8% of the variance in positivity. Instead, the major driving forces of positivity within team interactions were the behaviors preceding each positivity statement. Timing also played an important role (positivity was more likely in later time periods within a meeting). How do you see this study influencing future research and/or practice? In terms of research implications, our findings suggests that we really need to study the micro-level dynamics of behaviors in teams. Studies that focus on the individual or team level will likely miss out on most of the variance in subtle team behaviors such as positivity. In line with several calls for more dynamic team research, our findings emphasize the need to include a temporal perspective. Innovative methods such as Statistical Discourse Analysis, which we applied in this study, can help us address this need. Our finding that overall positivity was meaningfully linked to team performance has managerial implications. Team leaders should pay attention and actively encourage positivity in team interactions, as these behaviors help implement ideas and move the team forward. Positivity has been heralded for its individual benefits. However, how positivity dynamically unfolds within the temporal flow of team interactions remains unclear. This is an important oversight, as positivity can be key to team problem solving and performance. In this study, we examine how team micro-processes affect the likelihood of positivity occurring within dynamic team interactions. In doing so, we build on and expand previous work on individual positivity and integrate theory on temporal team processes, interaction rituals, and team problem solving. We analyze 43,139 utterances during the meetings of 43 problem-solving teams in two organizations. First, we find that the observed overall frequency of positivity behavior in a team is positively related to managerial ratings of team performance. Second, using statistical discourse analysis, we show that solution-focused behavior and previous positivity within the team interaction process increase the likelihood of subsequent positivity expressions, whereas positivity is less likely after problem-focused behavior. Dynamic speaker switches moderate these effects, such that interaction instances involving more speakers increase the facilitating effects of solutions and earlier positivity for subsequent positivity within team interactions. We discuss the theoretical and managerial implications of micro-level team positivity and its performance benefits. You can read “Understanding Positivity Within Dynamic Team Interactions: A Statistical Discourse Analysis” from Group & Organization Management free for the next two weeks by clicking here. 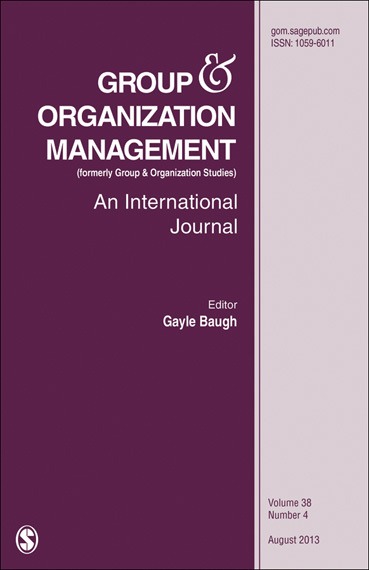 Want to know all about the latest research from Group & Organization Management? Click here to sign up for e-alerts! Can Virtual Teams Work Together as Well as Traditional Teams? In this article we develop a conceptual framework that examines the relationship between shared mental models, task interdependence, and virtual team performance. In addition, we use media synchronicity theory to examine how various attributes of the technologies used by virtual teams to communicate can influence the development of shared mental models. Finally, we employ a sense-making lens to explore in more detail how features inherent to different communication technologies influence the development of shared mental models. Our goal is that through examining these relationships, some of the mixed findings in prior virtual team research may be better explained. Read “The Role of Shared Mental Model Development in Understanding Virtual Team Effectiveness” for free from Group and Organization Management by clicking here. Want to read more from Group and Organization Management? Click here to sign up for e-alerts! 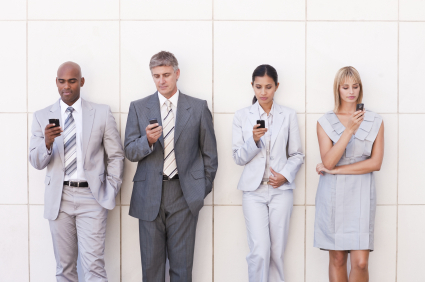 We report our survey research about what American business professionals consider appropriate or civil mobile phone behavior during formal and informal meetings. The findings come from two of our recent research studies: an open-ended survey of 204 employ ees at a beverage distributor on the East Coast and a nationwide, random-sample survey of 350 business professionals in the United States. There were significant differences by age, group, gender, region, and income level. The differences between women and men were quite striking, with men nearly twice as likely to consider various mobile phone behaviors as acceptable in informal meetings. This article is free for the next 30 days! Don’t forget to sign up for e-alerts to get the latest research first from Business Communication Quarterly. Small Group Research addresses and connects three vital areas of study: the psychology of small groups, communication within small groups,and organizational behavior of small groups. Visit Small Group Research for more articles on topics such as team performance, innovation, group citizenship behavior, and more–and sign up for e-alerts so you don’t miss out on the latest research in your field. Management educators who use teams in the classroom often face challenges in holding team members accountable for their performance. In a new Journal of Management Education podcast, associate editor Cindi Fukami talks with Dr. H. Kristl Davison of the University of Mississippi about her article, “How Individual Performance Affects Variability of Peer Evaluations in Classroom Teams: A Distributive Justice Perspective,” co-authored by Vipanchi Mishra of Iona College and Mark N. Bing and Dwight D. Frink, both of the University of Mississippi. Forthcoming in JME, the paper is now available in the journal’s OnlineFirst section. Click here to play or download the podcast interview or subscribe on iTunes by following this link. Dr. H. Kristl Davison is a Clinical Assistant Professor of Management at the University of Mississippi. She received her M.S. and Ph.D. in Industrial-Organizational (I/O) Psychology from Tulane University. She has worked as an Employee Selection Specialist for GTE/Verizon, and has also consulted in the areas of compensation, employee surveys, and statistical analysis. Her research interests include organizational justice and ethics, employment discrimination, gender and diversity issues, counterproductive workplace behavior, applicant faking, and personnel selection. She has published her research in journals such as Journal of Management Education, Academy of Management Learning and Education, Journal of Applied Psychology, Organizational Behavior and Human Decision Processes, Personnel Psychology, Journal of Vocational Behavior, Organizational Research Methods, and Journal of Business and Psychology. Dr. Cynthia V. Fukami is Professor in the Daniels College of Business at the University of Denver. She is currently Associate Editor of the Journal of Management Education, and serves on the editorial board for Academy of Management Learning and Education, among others. She has served on the Academy of Management’s Teaching Committee, and was the Chair of the Board of Directors of the Organizational Behavior Teaching Society (OB-1). She co-edited Sage’s Handbook of Management Learning, Education and Development with Steven Armstrong. What Is Experimental Vignette Methodology? How Does an Organization's Compensation System and Its Culture Affect Each Other? How Did 9/11, Financial Crisis Affect Hotel Performance?